My Japanese indigo seedlings got transplanted over the weekend. Or at least, some of them did. With scattered frost possible for tonight (yes, that would be June 7), I have the rest safely in the dining room in case I need to replant. Frost into early June is not unheard of here, and nights tend to be cool anyway well into June or July. So I try to protect these tender plants after I set them out. My system relies on recycled translucent plastic jugs. We buy our milk in glass containers, but neighbors save plastic ones for us. And I go through a lot of vinegar for natural dyeing and household cleaning, so I save those jugs, too. 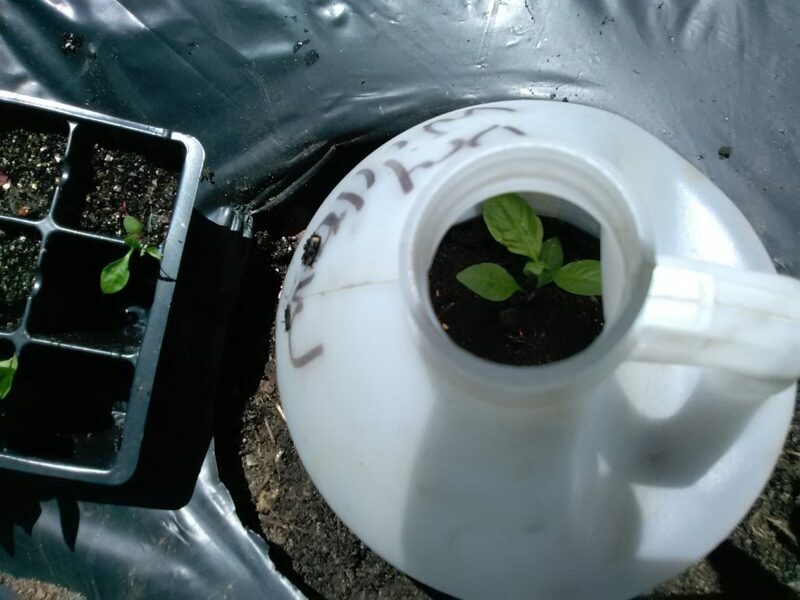 When I transplant indigo, tomato or other tender seedlings, I cut the bottom out of a jug, push it into the soil over the seedling, and remove the cap. That acts as a cloche, or mini greenhouse. Removing the cap is important. That lets heat rise on a warm day to keep the plant from cooking. We don’t remove cloches for watering, just water around them. That seems to work well for us in container growing (more on that next time). 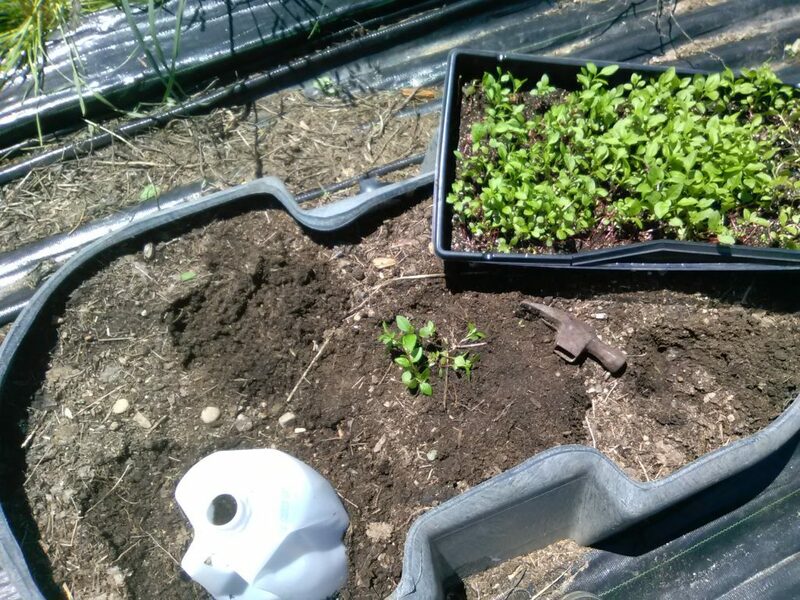 Last year, I set out my plants in early June (around the 7th, I think — my recordkeeping is spotty). Then I left for back-to-back conferences, so they stayed under cloches until June 30. Last year’s plants were spindly when I put them in the ground, and bigger but still spindly when I removed the cloches. But they grew like gangbusters after that. 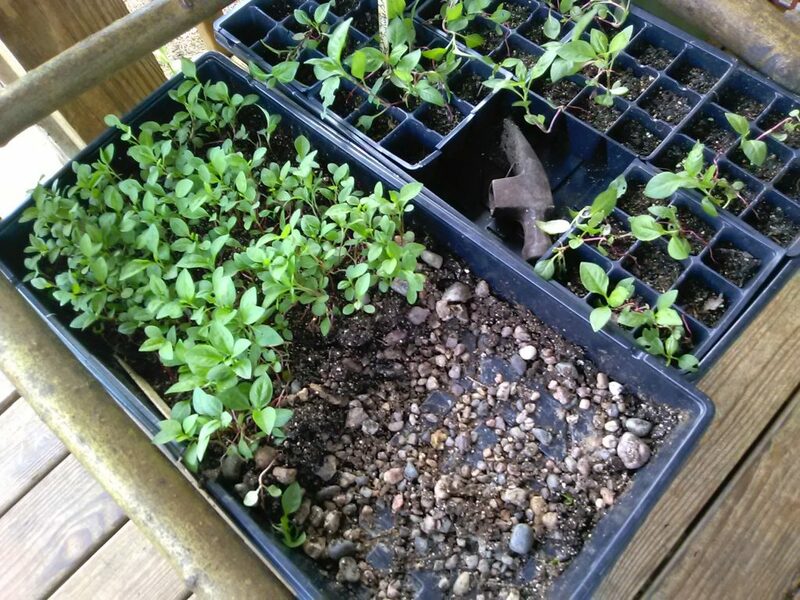 This year’s seedlings are healthier to begin with, thanks to Julie’s TLC. I may be able to remove the covers before I leave for the Willow Gathering in Decorah on the 19th, or have Bill remove them while I’m gone. From what I read, Japanese indigo seed that’s more than two years old is unlikely to germinate well. I still have two small packets of seed I saved from last year (just in case of a total crop failure). We never expected such good germination rates from the seeds I gave Julie to start, so we have more plants than we expected. I’ll find room for them. But even if I were unable to plant them all, I’d be glad to have those extra plants for insurance. 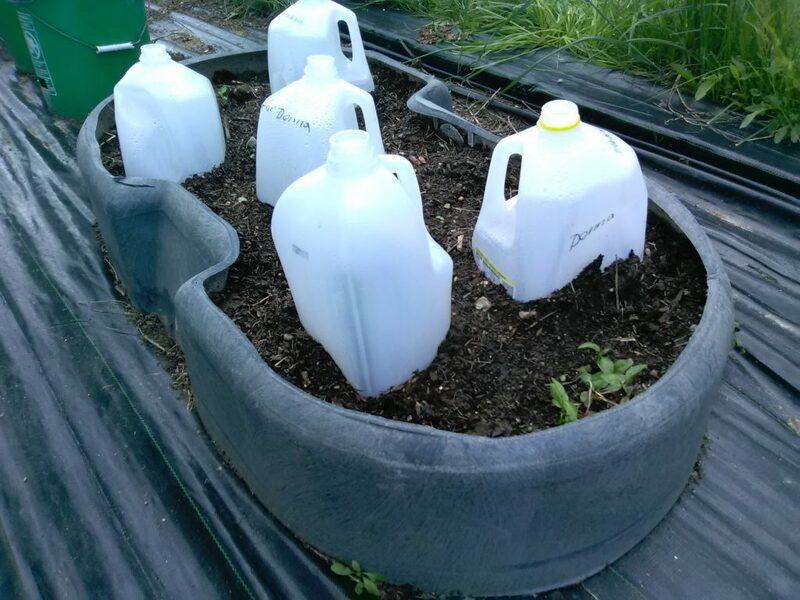 I don’t really expect to lose the plants under cloche if we get a light frost tonight: The jugs may even provide enough protection for the few uncovered plants tucked in between them. That’s an experiment. But we have a short growing season as it is. I hate to think of losing a whole year’s dye possibilities because of a late frost. So we’ll save more recycled jugs for next year.